Hi all, this is my first post on Club S12 so i'll start with some background. I bought an 85' CA20 auto hatch back in 2014, previous owner had put a ton of work (and dollars) into overhauling the engine as the car had sat in a shed for 20+ years. Only had 27,000 miles at the time of purchase. Thing ran amazing for the last four years, almost no problems aside from the occasional battery or alternator replacement, but lately I've been encountering an issue that I can't pin down and has slowly become more frequent. When I try and start the car the engine will fire once, then cease to fire and only crank. If I wait a minute I can try again with the same results, the only fix I have found is to simply wait 10-20 minutes, try again, and usually it will kick off no problem. Once in a fit of frustration I cranked the engine for 20ish seconds after which it slowly began to fire again until it started. I encountered this problem once in the summer, around mid-July, but didn't think much of it and considered it an isolated incident. Throughout the fall it started happening more frequently, about once a week in September to multiple times a day by November. I recently replaced plugs/wires/distributor cap/rotor in a repair attempt (thought rotor might be the root of the problem cause points were pretty corroded) but the issue persists. Pulling codes off the computer hasn't yielded much, it gives me "Fuel Pump" which I know can't be right cause I can hear the thing priming like normal whenever I turn the key. The only modification I've done to the engine has been to replace the OEM alternator with a GM One-wire, which I did during a period of voltage loss that turned out to be a bad battery. Still have the OEM alternator. As you can imagine this has become an extremely frustrating issue, and hard to track down because of it's intermittent nature. The car runs like normal every time it does start, and can idle indefinitely with no noticeable changes. I'm sorry for the long post but I wanted to put all the info out there for anyone who might know what could be wrong, this has me real stumped. I don't know if its a bad sensor or what, I live in Wisconsin so maybe it has something to do with the lowering temperature? Any help is appreciated. Have you checked your ignition coil(s)? One or both may be one their way out. Once it runs does it continue to run well or does it ever die? My 85 had a similar intermittent problem and it was due to failing solder joints in the ECU. Gave all the signs of a failing fuel pump. Once it's running, try wiggling the plugs on the ECU to see if it causes a problem. IF you clear the codes does the fuel pump code recur? Check this temp sensor connection because it corrodes and the connector crumbles with age. 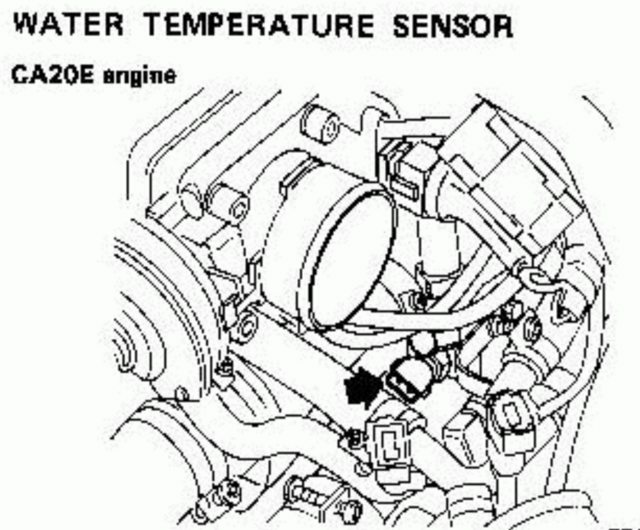 This temp sensor coordinates with he ECU to determine the air/fuel mixture. If this connection is failing then the ECU thinks the engine is always cold and that will cause a warm engine to do exactly as you describe. It runs fine every time it does start, never have to worry about it dying on me. Fuel Pump code does seem to pop up every time I clear the ECU and have the starting issue. I'll check the ECU connections and temp sensor in the coming days, car is currently sitting up at my parents place (heated garages go a long way during these cold December days) waiting for me to replace the ball joints. Right ball joint broke in half the other day while I was doing 70 on the highway which was pretty terrifying, luckily I was able to temporarily wire it back together and putt to safety. I think my coils are fine, I replaced the ignition coil probably about a year ago but I'll test them regardless. If once it starts it runs well w/o misses/skips/hesitations the ECU solder joints are probably ok.
Alright, probably a good time for an update. I finished replacing the ball joints and started driving the car again about a week ago. I think I might have jumped the gun earlier when I said the engine runs fine when started because it was missing really bad. This, combined with a number of no-starts, led me to explore the ECU solder joint theory. Nothing really stood out to me as a potential bad joint after inspecting the board, looked really good actually, but just to be safe I took a couple hours and re-soldered ALL the joints on the board. I stuck the ECU back in the car and... no change, still runs like crap, still had some no-starts. I tested the water temp sensor connection with a multimeter, and the wiring harness is sending power to the sensor. When the car is running and I unplug the sensor there is a slight change in rpm, so I don't think that's an issue. I swapped out my newer ignition coil with the old one that I thought was fried and finally had a significant change. The engine started missing less aggressively and the voltmeter on the dash was reading a bit higher, my newer coil must have been going bad. So I got a pair of brand new coils and swapped out both the intake and exhaust side, but didn't notice any significant change while driving. Car still runs like garbage, and to be more specific at lower rpms its not so bad, almost no missing at all, but the higher it goes the more frequent and aggressive the missing gets. Like if I floor the gas the whole engine seems to get bogged down and barely fires at all. I haven't had a no-start in a couple days, maybe the new coils fixed that at least but we'll see. Current readings the ECU is giving me are FUEL PUMP (again fuel pump seems to be working fine), AIR TEMP SENSOR, CYLINDER HEAD TEMP SENSOR, and idle switch/start/load signal. I've heard that those last three should be disregarded because they appear every time. All vacuum hoses look to be hooked up correctly, are there any other sensors I should be testing? I feel like there's not many more things that could be causing this issue. Again, thanks for the help so far, the most frustrating part is not having any leads on the issue. Only took a couple hours but I'm (pretty sure) I found and fixed the problem. Was doing some general stuff, cleaning grounds/electrical connections, when I found a small hole worn in the side of the rubber part of the farthest back fuel injector. Made a quick and dirty patch with some gorilla glue and took off on a test drive. Car ran like a dream, no misses/hesitations, just like the day I bought it. Will have to replace the rubber part to feel 100% in the clear, but I think this is a pretty good candidate for the problem, vacuum leak and all. Hope it lasts. That's a nice catch and not something evident from any of your previous descriptions. Please update again once you spent some time with it. Drove around on Tuesday with flawless performance for about 45 minutes or so, then some slight misfiring started. Got to destination, shut off the engine, came back a half hour later and... no start. Got it started after some waiting and cranking, but now it's back to running like garbage like before. Drive around a bit, shut off engine, try to start again with no luck, almost kill the battery by cranking, and give up. Guy seemed to have an almost identical problem to me, his ECU is even giving him the same codes mine is, so I decide to replicate his solution and check on the EFI relay. Do a quick test by switching the EFI and Fuel Pump relays next to each other, and sure enough now when I turn the key I can't hear the fuel pump priming like before. That's a bad relay. Order two relays to be safe and switch out both EFI and Fuel Pump, car still doesn't start. Remember battery is low and have a buddy jump me, engine kicks right off. Go for a test drive and IT STILL RUNS LIKE GARBAGE. So now I'm wondering what did I do on Tuesday to make it run so well? My crappy superglue patch on the fuel injector still looks like it's holding, but I don't really think that was the issue anymore. I don't remember doing anything else that could have made such a big change in performance. The only difference I can think of is the temperature, it was pretty warm out for a December day in Wisconsin, mid 40s, but I think the theory that that would affect anything is a bit out there. The engine has started up fine every time since the relay swap, but it's only been a day and I've been tricked before. I am curious about the jump being the thing that started the engine, cause it was still cranking at a semi-normal rate before with no start. Could it not be putting out a normal voltage/amperage, and that's causing the no start and misfiring? Could the temperature be affecting anything? Remember I'm also using this one-wire alternator, should I switch back to the OEM one? Does is make a difference? I'm just really confused right now. If you're still getting 13+ volts on your battery from whatever alternator you're running I doubt that's the problem. I'm still voting something with your ignition system. I had a car that gave me similar problems the entire time I owned it, and only saw a broken ground wire for the lower coil when the engine was getting pulled. I could usually get it going by pulling the upper coil wire and letting it rest 1 - 2 inches away from the coil so the spark arcs from coil to wire. No idea why, but it seemed to work. Here's a thread that show how some people upgraded their transistors with good result. It's for the VG but I think the CA has a similar setup, right? Been a while. Hello, i am curious if you have actually metered any of the sensors or tps, idle switch setup, if the idle switch is bad and thinks you are off idle it will run the pump slightly higher to bring pressure up, also have you checked you fuel pressure? i have seen where a fuel pump will prime but draw too many amps causing a code and not out putting enough fuel pressure. also once you start it and it starts to run like garbage have you tried pulling the coolant temp sensor and see how she does, mine was going bad and the ground plane cross references to the maf for the ecu so if that is going belly up it affects your maf readings as well. i would download the fsm and start doing an actual trouble shoot session metering everything and checking all connections as well. this forum is great and has many capable people, but it doesnt seem like you have given us enough true accurate info to help you out enough yet. please keep us posted, it is always nice to keep these cars on the road.